What a fantastic week you’ve had! I love the photos of the children on the trampoline. Trampolining is such a fun way to release excess energy. I’m a new fan of Brave Writer, and have been inspired by how you’ve been able to incorporate writing using her tools. We are not writing so much yet but I am inspired by your examples to make writing a more regular affair in our home. I’ve never seen buntings like the ones by your pond. What a wonderful thing to do for the local wildlife! The female stag beetle is also a great find. I don’t think I’ve seen a live one before. What a cute dog you have too! Thank you, Hwee. You write such sweet comments 🙂 The bunting was fab, wasn’t it? It was nice to think of other people being as excited by the swans as we have been. 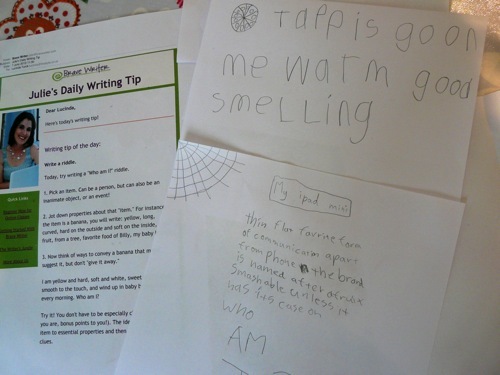 I love Brave Writer – both Julie Bogart’s practical tips and her whole homeschooling ethos. 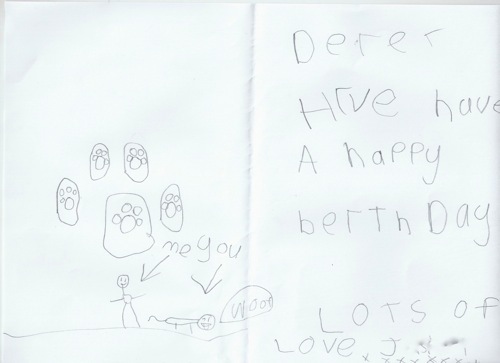 I think J(8) would write even less than he does if it weren’t for him wanting to join in with what he sees his sister doing – that definitely helps! As you can see, we have a way to go with spelling, but – one step at a time! I’m loving the subtle turn towards unschooling that is apparent in all your posts. It’s always fascinated me and I think you do it so well! 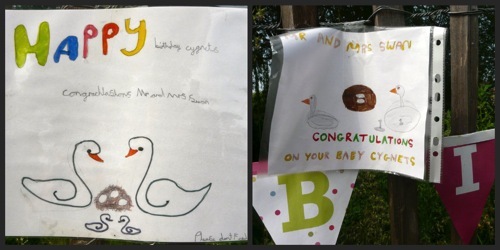 Can I just say how utterly jealous I am of your baby swans. They are soooo cute! Thank you 🙂 It’s funny, the thought of unschooling makes me slightly anxious! But I think you’re right, we probably are gradually moving more that way. In some ways my children don’t give me much choice! I chuckled about your children’s reactions to real people reading their blog. 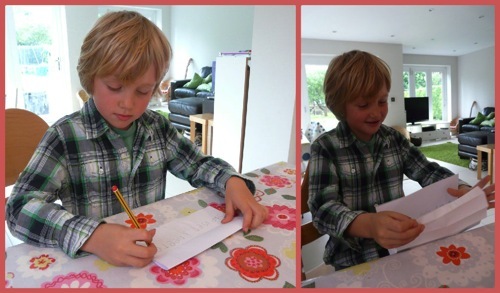 It’s such a fantastic idea and so good for children to have a real reason to write. Thank you, Rebecca! I half-hoped one of my children would get interested in bugs so that I could learn more about them alongside, but they’re both as squeamish as ever! Fireflies sound like a great interest! I will have to play the consequence game with my kids. What a great week. That is the coolest bug. Wow. What a great week you have had. It was very cool! Thanks, Phyllis. 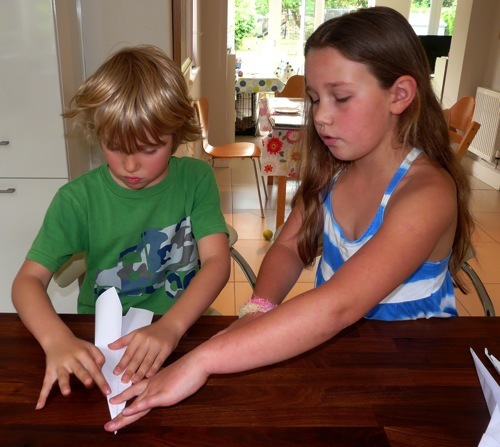 2 things: we’re all about paper airplanes here and love the KLUTZ paper airplanes book! I’m also going to play Consequences with my kids now. Thanks for the tip! Klutz books are fab, aren’t they? The aeroplane book was a great gift from J(8)’s Godfather. Thanks for hosting the fab link-up! 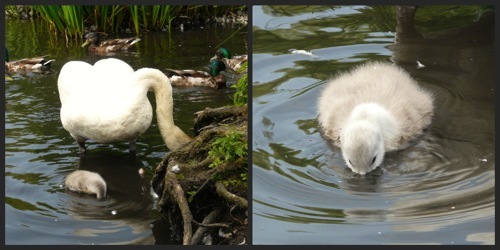 What great pictures of the stag beetle and cygnet! 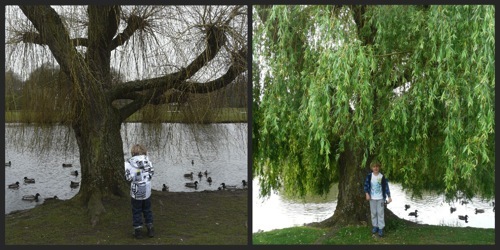 My boys have been wanting to see a cygnet since we read The Trumpet of the Swan. Thanks, Carol! And for the tip about the book – we haven’t read it, but we will now! 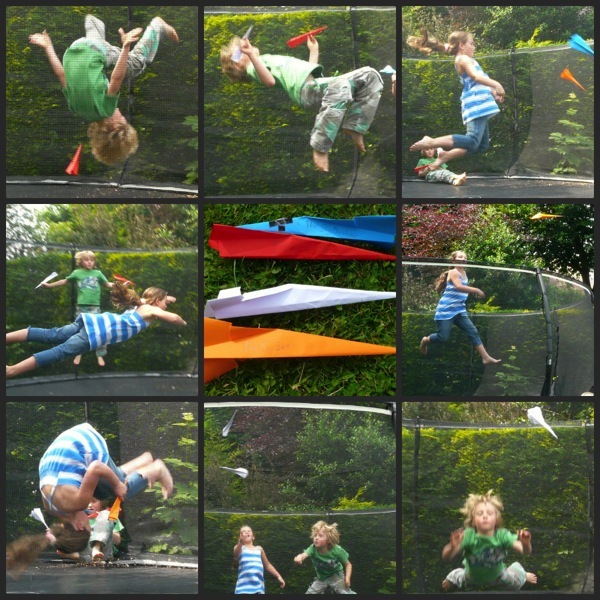 I love the pictures of the kids and the airplanes and the trampoline! How fun! Keilee would still love doing something like that. 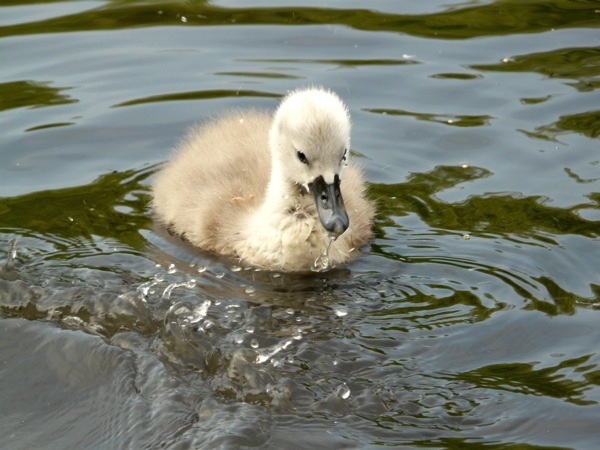 “Your” cygnet is gorgeous. I always love your ‘nature’ photos. 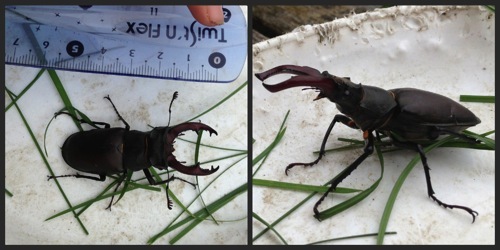 Great pic of the stag beetle also. We have a free insect museum that I wish I could ‘whisk’ you and the kids here for the day. VERY cool insects. Happy weekend! Now that would be a great way to get my kids into insects – what fun! Happy weekend to you and Keilee, too! What a riot those trampoline photos are! You got some GREAT action shots there! Amazing swans! But that beetle – ick! 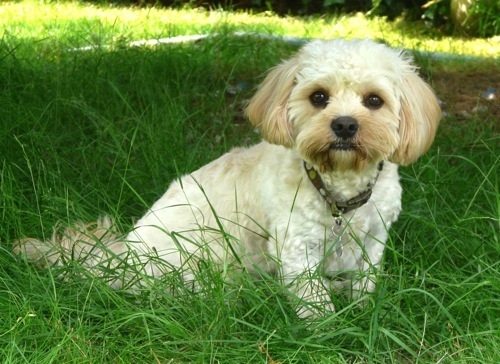 LOL I’m all for nature, but bugs and snakes…:shudder: Happy birthday doggie! Thanks Jessy – they were all great subjects! I’m so with you on the bug front – ick indeed! 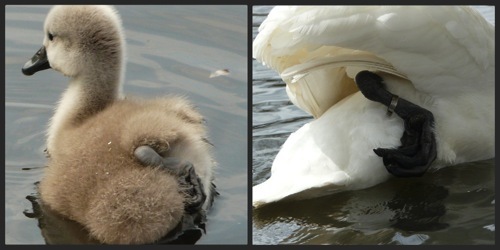 That cygnet is adorable! Makes me think of E.B.White’s The Trumpet of the Swan, one of our favorite read-alouds. So neat to “meet” you from across the pond! I’m so glad you and Carol mentioned The Trumpet of the Swan, we haven’t read it but we loved Charlotte’s Web (and we love cygnets!) – it’s now on my read-aloud wishlist. That is one disturbing bug. I have never though of putting fish in a stir fry but most of the fish I buy would flake away to nothingness. I guess Mackerel holds together better. It sounds like an odd combination, doesn’t it? I saw it in Easy Cook magazine a long time ago and to my great surprise it turned out to be one of my children’s favourite meals, so it makes a regular appearance round here. Freezes well, too. Stag beetles are so cool. And big! But yes, cool, for sure. I am going to have to look for Consequences! We are really into games right now. 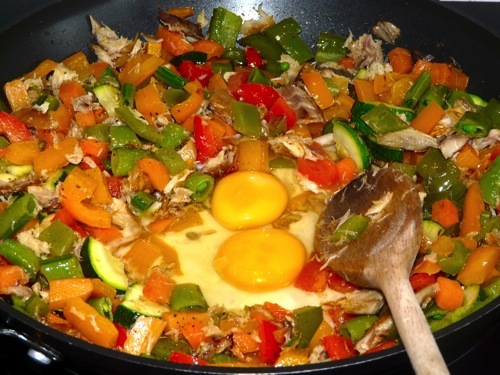 That mackerel stir fry looks yummy!! My girls usually get along, but sometimes they don’t and it’s so difficult to know what to do…they both want me to take their side. I feel so much more at peace when they get along. Thanks Theresa, we’re all so pleased we got Harvey 🙂 I think I’m noticing nature so much more this spring and summer thanks to how often we’re outside with him. I highly recommend Consequences – and best of all, it’s free!